Yellow Jambhala (Tib. 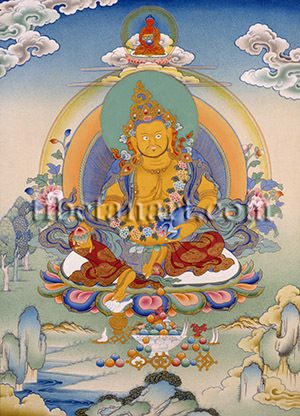 Dzambha-la ser-po) is the most popular wealth deity in the Indo-Tibetan Buddhist tradition, and as the 'Lord of Riches' he is invoked to bestow wealth upon practitioners. Jambhala is closely related to Kubera and Vaishravana, the yellow Guardian King of the North and Lord of the semi-divine yaksha spirits who traditionally serve as treasure-guardians. As a wealth deity Jambhala frequently appears among the protector deities in the lower area of thangka paintings. Statues of Yellow Jambhala are also employed in wealth rituals, where a hundred-and-eight water offerings are poured over his head whilst Jambhala's mantra is recited: OM JAMBHALA JALENDRAYE SVAHA. Jambhala is golden-yellow in colour with the corpulent and pot-bellied bodily form of a yaksha-king, with two eyes and two arms. He is regal, proud and peaceful, although his face has a slightly frowning expression with two round wide-open eyes, a mustache, a goatee and a closely-cropped beard. He is adorned with garments of embroidered and multi-colored silks, a garland of heavenly utpala lotus flowers, and the golden ornaments of earrings, necklaces, bracelets, armlets and anklets. He wears an ornate five-jewel crown with half of his sapphire-blue hair bound up into topknots, while the other half hangs freely about his shoulders and back. He sits in the lalitasana posture of royal-ease upon a white moon-disc and an open multi-coloured lotus, his left leg drawn up and his right leg slightly extended. His left foot rests upon the treasures of a nectar-filled white conch-shell and a golden treasure-vase, although these ‘treasures’ often appear as a conch (Skt. sankha) and lotus (Skt. padma), representing the ‘heads’ of the great treasure-guarding naga-serpents Sankha and Padma. With his right hand Jambhala holds a large orange pomelo or citrus fruit (Skt. bijapuraka). And with his left hand he holds and squeezes a ‘treasure mongoose’, which disgorges a rain of jewels from its mouth that pour down over the offering bowl before him. Jambhala’s body radiates blazing light-rays and his radiant aura is encircled by a golden rainbow with flowers blossoming on either side. As a wealth deity Jambhala belongs to the Ratna or Jewel-Family of yellow Ratnasambhava, although he is shown here with Amitabha, the red Buddha of ‘boundless light’ appearing directly above him. Below Jambhala are the offerings of jewels and the seven precious insignia of the chakravartin or ‘universal monarch’: (1) rhinoceros horn (horse); (2) round earrings (queen); (3) square earrings (minister); (4) triple-eyed gem (jewel); (5) lozenge (general); (6) tusks (elephant); (7) coral (wheel). The general’s white lozenge appears behind the blazing central jewel that crowns the assorted auspicious offerings that appear within the translucent crystal bowl below Jambhala.